Backyard Workshop is dedicated to finding you the best products available to meet your particular needs. You help support us through our carefully chosen links which earn us a commission. Read more about our standards. A leaf blower is one of the must-haves for anyone who is serious about gardening. Ask anyone that owns one if they would be willing to give up their blower and go back to not having one. Of course their answer would be a resounding NO. Why would you bother paying someone to come in and clean the yard when you can do it on your own? The initial costs may be higher, but in the long-term you will realize that the benefits outweigh the costs. Is A Battery Powered Leaf Blower the Right Choice? If you want to have a leaf blower for tidying the garden, drying the car, or for any other task, you will be overwhelmed with the options that are available in the market. There are tons of brands that are available, each claiming to be the top leaf blower. Some models only have basic functions while others have high-end features. While there are many factors that you have to consider when looking for the best leaf blower, one of the first things that should be given careful thought would be whether to purchase one that is corded or cordless. To help you out, in the rest of this post, we will briefly tackle some of the pros and cons of a cordless leaf blower. This is to provide you with insight into weather a cordless, battery powered tool is right for you or if you are better off with a corded leaf blower. TL:DR - WHICH TYPE OF LEAFBLOWER SHOULD I CHOOSE? If your yard is smaller, you care about how noisy your blower is and mobility is important to you, you will be happy with a battery-powered cordless blower. If you have a large to very large property with many trees, you don’t have neighbors or don’t mind bothering them with noise you should pick up a gas powered blower. Finally, if you have a medium-sized yard with trees, live in a wetter fall environment and don’t mind winding and unwinding a hundred feet of extension cord or more – you’ll probably want a corded electric leafblower. One of the best features of battery-powered leaf blowers is their mobility. They can be used nearly anywhere. For many homeowners, this feature is the best thing about a cordless leaf sweeper. In the case of corded electric leaf blowers, you need to have an electricity supply nearby within extension cord range. Gas powered blowers are portable but emit carbon monoxide so you can’t use them in an enclosed place like a garage. With a cordless battery leaf vac, you will have the freedom to work almost anywhere, even if there is no electricity or ventilation nearby. Aside from portability, cordless blowers are also beneficial because they will make it easier for you to move around the garden or in any other area where you are working. You will never have restrictions based on the length of the wire that connects the tool to the source of power. Even if it is a huge lawn you have to clean, there is no problem as you can go around while holding the leaf sweeper in your hand. Another good thing about a cordless leaf blower is the fact that you have choices when it comes to power. In a corded leaf blower, it is only powered by grid electricity. On the other hand, in the case of a cordless counterpart, you can choose from one that is powered by gas or a battery. Those that are powered by gas are more powerful, but they are noisy and can produce harmful emissions. Battery-powered leaf vacs, on the other hand, are lighter in terms of weight and operates with significantly lesser noise. If either raw fan power or quieter running noise is important to you, a cordless lawn rake will be the choice to consider. You won’t usually get the best of both in the same package. Gas-powered tools can be more powerful than corded ones, but they usually are a little bit louder. At the other extreme, li ion battery blowers are much quieter but generally don’t have the blowing power a corded electric tool can muster. The most significant drawback of using cordless leaf sweepers is the runtime will be significantly shorter compared to corded units. Corded electric leaf blowers will operate the entire day as long as it is plugged in and the grid is up. (Frankly, if the grid is down don’t worry too much about blowing leaves off your lawn.) However, in the case of a cordless leaf blower, the power is limited only based on how much gas is the tank filled or on the basis of the capacity of the battery. For some people, the downside of pouring gas or buying multiple batteries outweighs all other features a cordless model has to offer. There’s no doubt it’s frustrating to have to stop in the middle of a job because you’ve run out of battery or fuel power. If this is the most important feature for you, a corded model will suit your needs nicely. When Do Snowblowers Go On Sale? Is Pressure Washing Brick Safe? 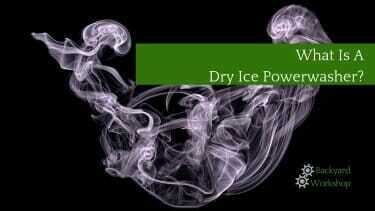 What Is A Dry Ice Power Washer? Back Yard Workshop is a participant in the Amazon Services LLC Associates Program, an affiliate advertising program designed to provide a means for sites to earn advertising fees by advertising and linking to Amazon.com.